Last year the Metcalf Foundation released a report on working poverty in Toronto. It found that 113,000 people were living in working poverty in the Toronto region in 2005, a 42% increase from 2000. 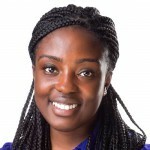 The report findings indicate that people living in working poverty most commonly work in sales and service occupations; work comparable number of hours and weeks as the rest of the working population; are over-represented by immigrants; and are only slightly less-educated than the rest of the working age population. That report raised questions for us on the impact that working and living in poverty has on health. How healthy are people who are working but still can’t make ends meet? How does their health compare to those who are working and have good incomes? How do both of those health outcomes compare to those who are poor and not working? We used data from the Survey of Labour and Income Dynamics, and the Metcalf definition of working poverty to answer these questions. These data show that those who are working but still live in poverty have worse health than those who are working and are not poor. In 2009, in Ontario, 49% of the working poor rated their health as excellent or very good as compared to 66% of those who had sufficient incomes. Similarly, 19% (almost 1 in 5) of people who were working and still poor rated their health as fair or poor compared to 8% of those who were not. 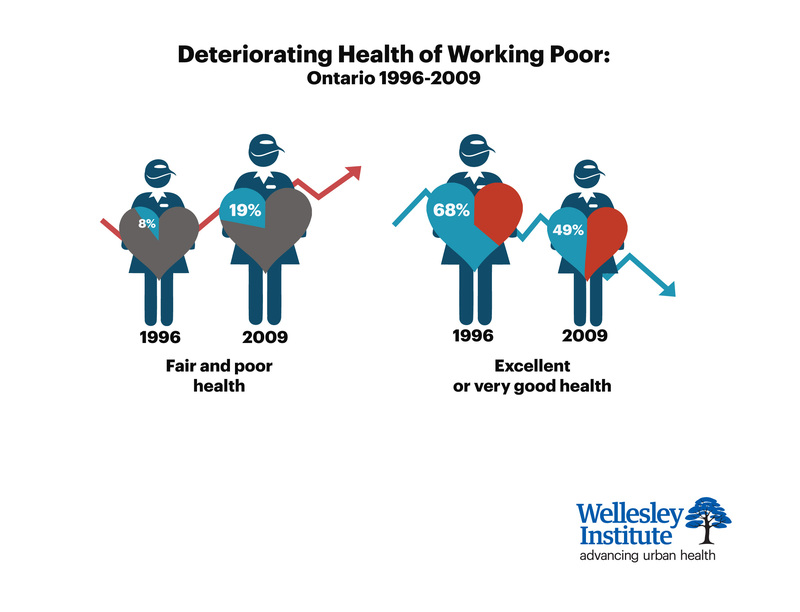 The health of those who have sufficient income has remained fairly stable between 1996 and 2009. However, the health of the working poor has deteriorated. 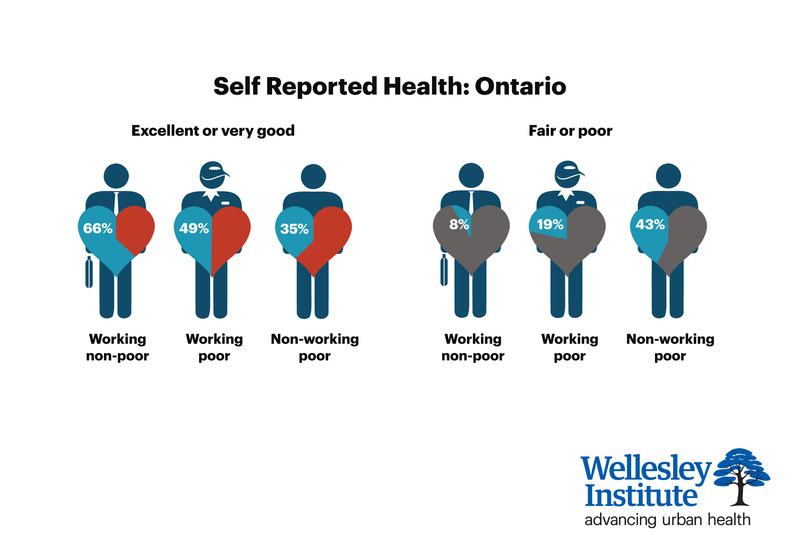 The share with excellent or very good health has dropped from 68% to 49% in Ontario. During that same time the share with fair or poor health increased, from 8% to 19%. These data show the relationship between work, income and health. Those with higher incomes, more secure employment and better working conditions have better health. These data also show a widening gap between the health of people who are living in poverty and working and those whose work provides sufficient incomes. This suggests that worsening labour market conditions, a weakened social safety net and increasing income inequality are accompanied by rising inequities in health.